Google Calendar vs Zoho Calendar. What is the best of Productivity tools? Today, Zoho updated its Zoho Calendar and released it out of beta. 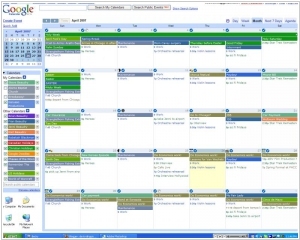 And Zoho's chief evangelist, Raju Vegesna, called this service the best online calendar in the market. Given that he is a modest person, and Zoho never promoted its products with loud statements, perhaps, this is true. At least, this service is no worse than Google Calendar, simply because it's a complete clone of Google Calendar. Zoho Calendar allows to create multiple calendars, share them (with different access levels), set reminders (by email, RSS), send invitations, embed public calendars on your site / blog. It has a plugin for Outlook (for synchronization), mobile version and supports offline access with Google Gears. Calendars can be synchronized with external services via ICAL protocol. 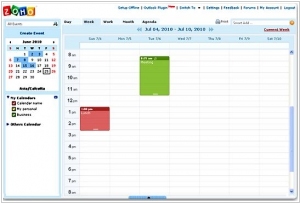 And of course, Zoho Calendar is tightly integrated to other Zoho services (CRM, Projects, Planner, Mail, Chat).